Salvation And Survival: "Beware Of The Natural Familiarity of Ichabod Churches"
"Beware Of The Natural Familiarity of Ichabod Churches"
Are you as intrigued by that statement as I am? It certainly captured my attention when reading an article written by John Burton for Charisma Magazine. But, what exactly is an "Ichabod Church"? To understand this reference, one must go to the Old Testament and the Book of 1 Samuel. There the Israelite Judge Eli (who helped raise the prophet Samuel) and his family were judged disrepectful of the Lord, despising the sacrifices and offerings made to Him, and taking the choice parts of meat and fat for themselves. So, in essence, what John Burton is alluding to is the fact that the glory of God has left our churches today. At the heart of his article is this statement: "Most every day, in one venue or another, I'm hearing from disillusioned, frustrated people who cannot find a church that has been overtaken by the Holy Spirit. No extreme revival atmospheres can be found for many. The Upper Room experience that innumerable desperate people are searching for are nowhere to be seen, in some instances, within 500 miles of where they live. They complain of short, ordered, controlled services that, according to them, aren't worth their time. There's a measure of spirituality, but they don't even come close to the explosive, supernatural experiences they are craving". Now, when I read this my heart was pricked, and my mind became super-charged, and I felt as if God was down-loading thoughts faster than I could comprehend them and tie them all together! First of all, we know that the Ark of the Covenant was the presence of God with the Israelites. 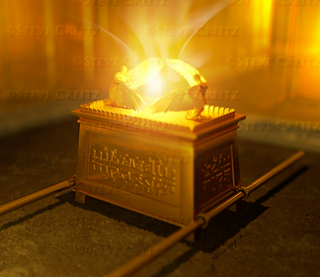 So, if the ark is gone, then the glory [and His presence] of God is gone. But how do we define the glory of God? What is it? It is certainly true that, in history, God's glory has been externally manifested not only in the Ark, but in the plagues; the pillars of cloud [by day] and fire [by night]; in His appearance on Mount Sinai; in the fire initiating the sacrificial system; and in Solomon's Temple. His glory certainly became a reality at the birth of Christ and will be evident in the restored Zion and the heavenly Jerusalem, in the future. But what should His glory look like for us today? And if Mr. Burton likens our modern Churches to a condition similar to the circumstances surrounding the birth of Ichabod, what is he really saying? Let me see if I can connect the dots between his article and what the Lord is showing me. I have heard it preached and spoken by today's pastors that "God’s glory can be seen in things such as love, music, heroism and so forth—things belonging to God that we are carrying “in jars of clay” (2 Corinthians 4:7). We are the vessels which “contain” His glory. I can't disagree with that, but if we are the vessels that contain His glory, what about those vessels in the Upper Room on Pentecost? Why have we, in the modern Church, dismissed the glory that they contained? Why do we dismiss the signs and wonders and the power of the Holy Spirit that was evidence of God's glory in them? In his article, Mr. Burton likens the state of our churches to the Wise and Foolish Virgins in the Parable of the Ten Virgins. 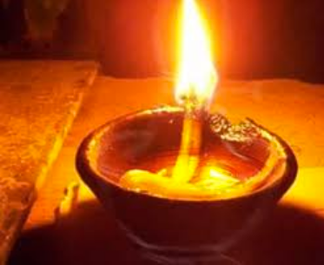 In this well-known parable, half of the Virgins have their lamps full of oil (which is representative of the Holy Spirit in the Bible). The wise Virgins had been in recent contact with the dispenser of oil (Holy Spirit), whereas the foolish Virgins had apparently procrastinated. Engaging frequently with the dispenser of the oil [the Holy Spirit], the wise had an adequate supply of oil to trim their lamps and go into the marriage supper when the bridegroom finally arrived. They were prepared! But the foolish Virgins think they can just borrow some of the oil from their wiser counterparts. But that's not how the Holy Spirit works! And this gets to the crux of Mr. Burton's premise: "Churches are filled with people the Bible would call foolish—those who are not spiritually vibrant, personally disciplined, and deeply intimate with Jesus. Their lamps are empty... If a church is ablaze with the spirit of prayer and alive as the Holy Spirit blows and burns through everyone there, those who are asleep and without any oil will definitely not feel comfortable. There is no way they can integrate in such a place without feeling the pressure to fill their lamps". Then he asks, why are we so willing to share our oil; to dilute the glory of God in the presence of the Holy Spirit in order to make those people feel comfortable? Why is the Church of today so willing "to integrate nicely with others who are equally resistant to the deeper things of the Spirit? They are [all] spiritually interested, but not spiritually invested. They have not paid the price and have not bought their own oil". Here's the thing ... the oil (Holy Spirit) cannot be borrowed. And it cannot be passed from one person to another. Each person must determine just how much of the Holy Spirit he or she wants. This principle reminds me of those 120 who were present in the Upper Room at Pentecost. But do you recall that after He was resurrected, Jesus appeared first to Peter, then to the 12 Apostles, and then to more than 500 of His followers? Acts 1:3 says, "He presented himself alive to them after His suffering [on the Cross] by many proofs [signs and wonders], appearing to them during forty days and speaking about the kingdom of God". The Bible tells us in Acts 1:2, that just before He ascended into Heaven, He left instructions for ALL of those followers and apostles [which means "sent ones"; not restricted to the Twelve]. He told them all to wait in Jerusalem for the gift of the Holy Spirit; that which had been promised by the Father [in Joel 2]. So there were at least 512 people who had seen the resurrected Christ and been told to wait in Jerusalem for the Holy Spirit. Why were there only 120 who received Him? Did the others get tired of waiting? Did they think they had lots of time and weren't diligent about being prepared? Or did they think that the gift of the Holy Spirit wasn't for them or worth their while? Do you see the similarities with the Foolish Virgins? With the modern Church? If we think that we're on solid ground, or good enough, with being saved and having the Holy Spirit indwell us, and thus being content with a moderate level of the Holy Spirit in us... aren't our lamps only half full? Don't we want the full measure of Him, which means we are willing to pay the price to seek Him on our own? Do we really want to be like those 200 or more people who missed out on the Upper Room experience because they weren't willing to pay the price to wait for the Father's gift of the Holy Spirit? As Mr. Burton writes, "Those who had their lamps full, those who responded to the command of Jesus to wait and pray, were ready when the wind and the fire came!" So, I believe the underlying message to the Ichabod Churches and to the foolish Virgins is this: Don't quench the desire of the Holy Spirit to manifest among you in the supernatural power of Heaven. Don't restrict His Presence because some are uncomfortable, or lazy, or fearful. Don't limit His Presence to the lowest common denominator. The glory of God is to make His Presence known; to pour out His Spirit on all mankind. What He did in the Upper Room at Pentecost is His desire for you and me. We must not let His glory depart on our watch! Exodus 24:17 "Now the appearance of the glory of the Lord was like a devouring fire on the top of the mountain in the sight of the people of Israel".